The Phuket Tiger Kingdom might not be to everyone’s taste but we however took an hour to stop over and see for ourselves if animals were at least well treated. 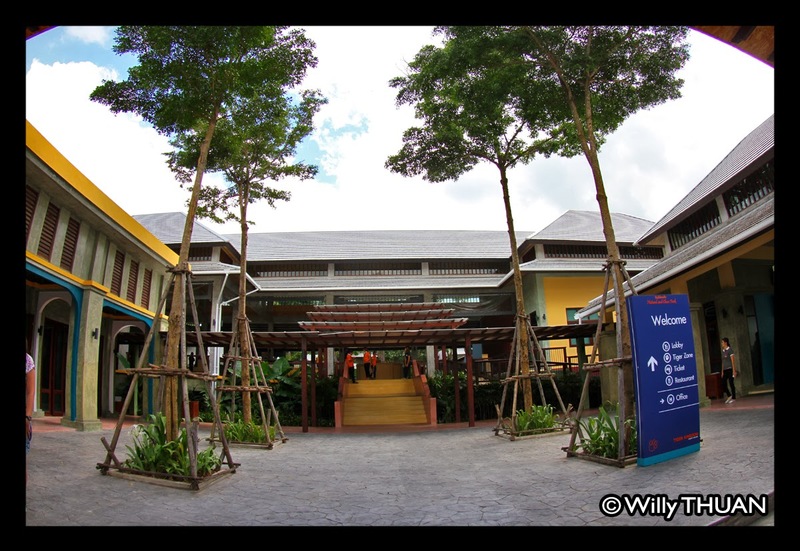 This new Tiger Kingdom is located just next to the well-known and long established Go-Kart race track, just before climbing the hill leading to Patong Beach. The place is surprisingly large, clean and very well organized and as soon as you enter you’ll see the several options offered to the visitors. 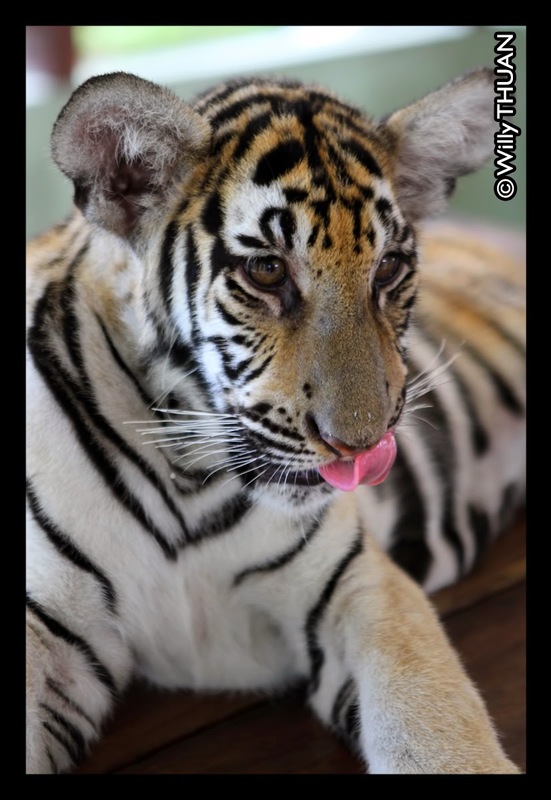 There are four sizes of tigers: smallest, small, medium and big and price is according to the popularity. Obviously the cute cubs and the massive adults are the most popular but you can choose all kinds of combinations according to your budget, just be aware that it doesn’t come cheap. 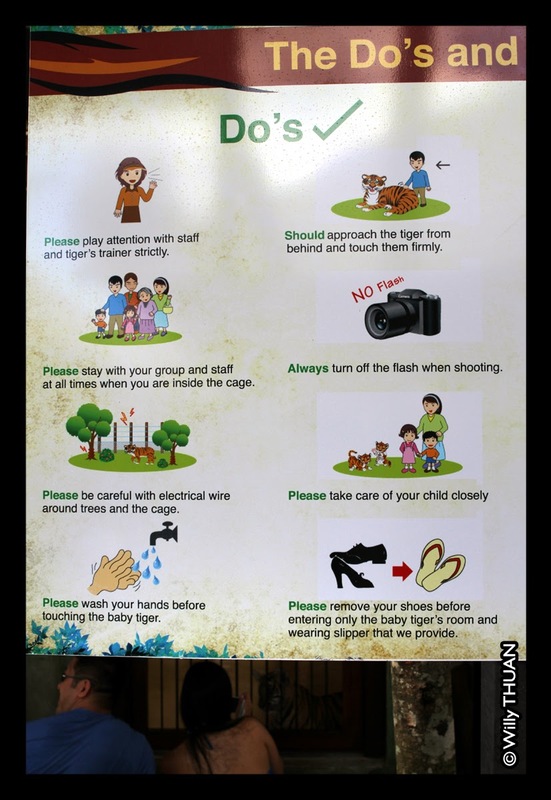 Prices at the time we visited The Tiger Kingdom are as follow: smallest: 1,000 baht, small: 900 baht, medium 800 baht, big 800 baht. 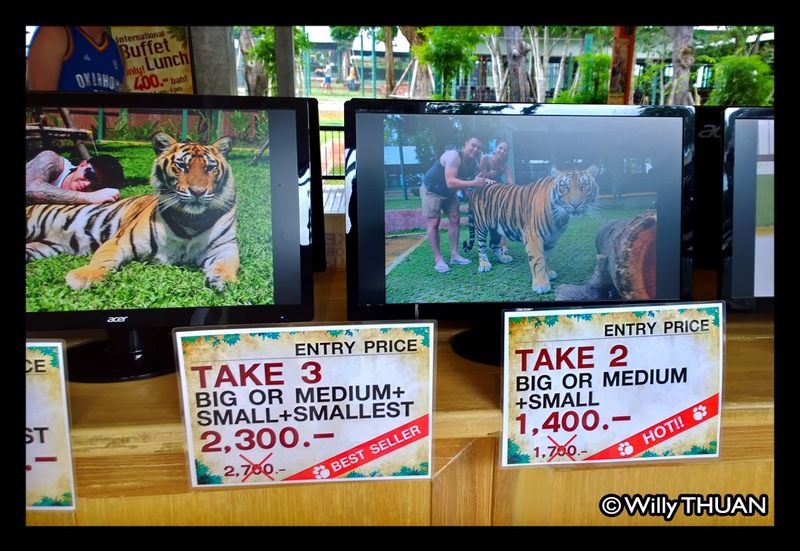 Then you can get a combination of two tigers (big or medium + small) 1,400 baht, three tigers (big or medium + small + smallest) 2,300 and the Full Monty (big + medium + small + smallest): 2,800 baht. Since everyone who enters the enclosure has to pay the full price, whether you want to take your photo with the feline or not, the total bill can be quite steep. We went in and asked lots of questions… the animals are in excellent condition, nicely groomed with a beautiful fur, no bad smell and enclosure are kept spotless. Many of the tigers are lazing around, leading inevitably to the usual statement ‘tigers are drugged’, which no one can of course prove nor demonstrate. 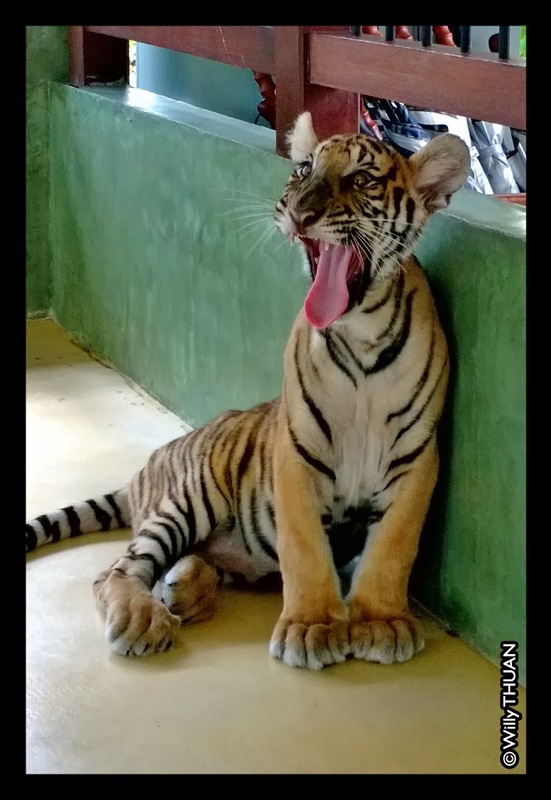 The guide’s answer was they are not, this is the daytime behavior of well fed tigers born in captivity… as he said, we should come back at 5pm when tigers get hungry and see how restless they become. 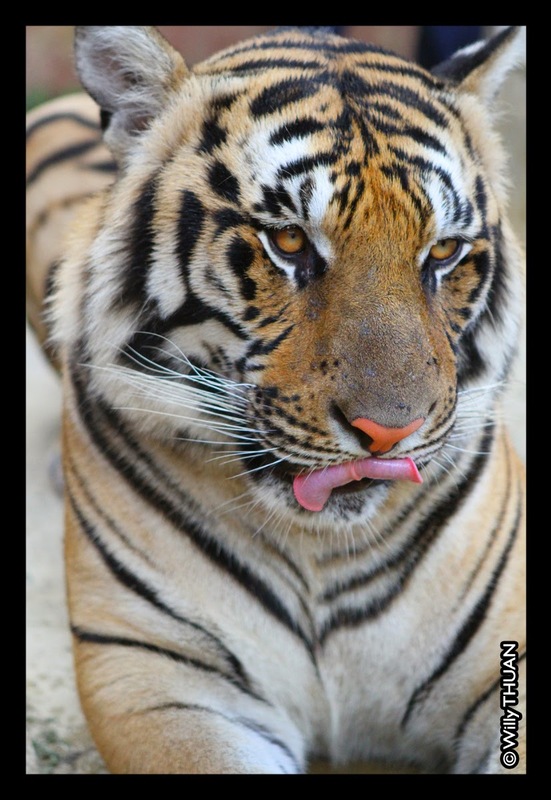 The tigers responded well to the attention given to them. The guide gave us a lot of interesting information so don’t hesitate to ask anything as they do speak English. 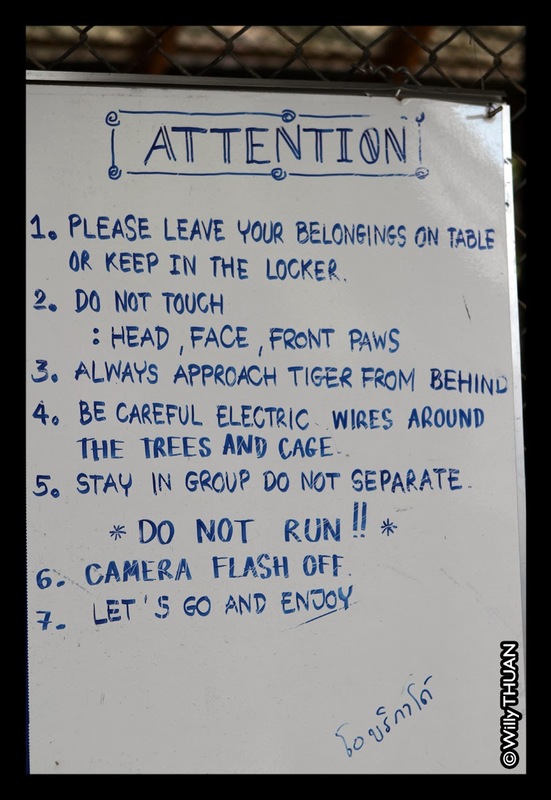 Note that for your own safety there are rules to respect: wash your hands before walking in (tigers are cleaner than you are :D) Don’t bring your bag inside as tigers apparently love to play with the straps. Don’t use flash, don’t walk alone in the parks and don’t make loud noise. Once we saw the size of the beasts, we certainly didn’t feel like doing anything that could upset them. The young tigers might be considered ‘small’ but just one of their paws is as big as your face! 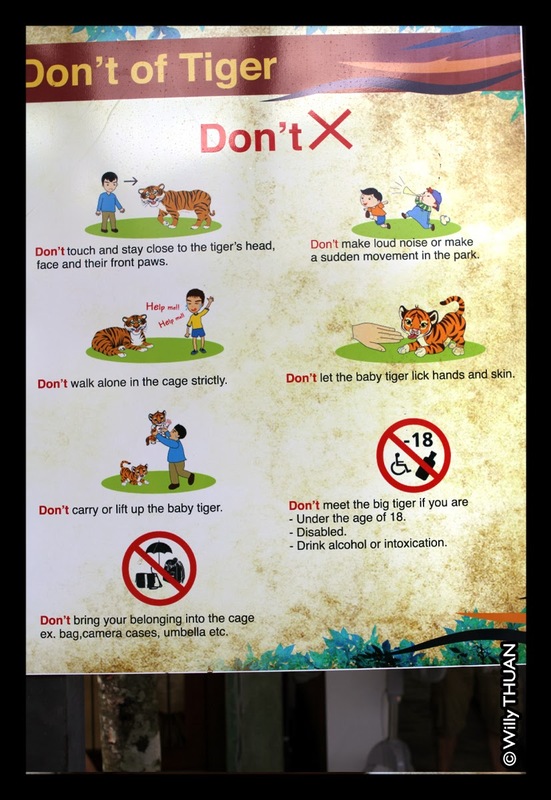 We went around several rooms and gardens and took our photos, and whether we agree with the idea of tigers being kept in captivity, it is hard not to have a broad smile when holding a baby tiger or lying down next to a full grown feline. So we did our inspection and are reassured that animals were extremely well treated. Now it is entirely up to you to decide if you want to see the tigers or not. Open: Daily 9 am to 6 pm Tel: 076 323 3112 Location: Next to Go Kart on the way to Patong from Phuket town Note: there is a photographer on site to take your photo if needed.